Wisconsin program teaches about glaciers and the outdoors. Wisconsin’s ColdCaching program includes a self-guided GPS tour of glacial history for families at Devil’s Lake State Park. My kids and I stood bundled up in 6-degree weather, wearing facemasks and snow pants while trying to work a handheld GPS along the Wisconsin Ice Age Trail in Devil’s Lake State Park. The land was barren, brown and peaceful — a typical winter landscape. “I think we’re supposed to go that way,” 10-year-old Caleb said uncertainly, pointing, while 8-year-old Anna shivered beside him. Why didn’t I pay closer attention to the park naturalist’s instructions? It’s said that the average American child engages in only four to seven minutes a day of unstructured play outdoors. I’ve come to realize that for our children to grow up caring about our planet, I need to fight my urge to hibernate and expose them to a winter wilderness that extends beyond the backyard. That’s why we decided to try Wisconsin’s family-oriented ColdCaching program. It runs along the Ice Age Trail, which winds through 31 counties and is one of 11 National Scenic Trails. ColdCaching is like geocaching, except instead of using latitude and longitude to hunt for treasures hidden by other players, you climb and hike to discover geological formations left behind by retreating glaciers around 12,000 years ago. “We wanted people to get out on the Ice Age Trail and learn about the geology,” said Dolly McNulty, volunteer ColdCaching coordinator, who originated the program. 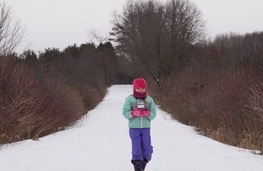 The author’s daughter commandeered a GPS in search of rock formations on the Ice Age Trail. Our hike began around noon, when we picked up our free supplies at the park’s nature center. Inside the blue backpack was information on the seven ColdCaching sites and a simple handheld Garmin GPS. A park naturalist walked me through the preprogrammed device. Caleb, eager to pair two of his favorite things — technology and the outdoors — headed outside with it, ready for adventure. “Some of these trails are too icy,” the naturalist said, gesturing to Anna. She put X’s on a paper map to recommend three sites. It took me a moment to figure out which way was north, given that I had relied on my iPhone’s GPS to get into the park. All three sites were close enough to the road that we non-hiking ColdCaching novices could find them. Our first stop was Steinke’s Basin, an extinct glacial lake. “I don’t get what we’re supposed to be looking at,” Anna said. There was nothing striking about the land in front of us, mostly just dead and dormant plants. But McNulty has done a beautiful job of writing up the sites for visitors, and I flipped through the laminated, ringed sheets that she had put in the backpack. I read out loud about how the glaciers carved out the former lake. “It’s what used to be there that interests us,” Caleb said. “Right,” I said, as we pulled on our gloves. We got out of the car, and he led us with the GPS down a footpath to hike the basin. The dotted path on its interface switched directions, so he tried switching directions, too. Again, the arrow moved. “I don’t get it,” he said. Neither did I. I tried my phone’s GPS (you can download many geocaching apps for free), but I no longer had service. We hiked 20 feet up one path, and then 20 feet up another as the wind whipped our faces. Anna looked at the skeletal trees, cold and unimpressed. “Can we go to the next one?” she asked. We piled back into the car. At our next stop, it was her turn to use the GPS to search for ventifacts, stones shaped over time by windblown sand. We forged into the woods, and not being able to see the car discomforted me. I had wanted to get lost today, like pioneers on a new frontier, gaining new navigational skills. But it was too cold for mistakes, especially given we were all alone on this snowy trail. What if we got turned around and couldn’t find our way back? I stood there, uneasy and embarrassed by my lack of basic survival skills. Anna’s facemask fell, revealing a bright pink nose. “There,” she shouted, pointing to a rock formation from the bluff we stood on. I wasn’t sure she was right, but I was too cold to figure it out, and I loved her pride. We hurried back to the car to warm up, heater blasting. As we drove on, a gray coyote crossed the road in front of us. “This would be really fun in the summer,” my son said, sighing wistfully. Or if I could read a GPS, I thought, disappointed in myself. “I always thought the glaciers were in northern Canada, but they were right here,” my son said to my daughter. As he continued, I realized that while I may not have accomplished my goal, McNulty had accomplished hers. My children, with a renewed interest in the glaciers that went beyond the movie “Ice Age,” were making plans to come back and conquer the wilderness — in the summer. There are 40 ColdCaching sites along the Ice Age Trail throughout Wisconsin, including Devil’s Lake State Park. Closer to the Twin Cities, ColdCaching park packs are available at Interstate State Park and Chippewa Moraine State Recreation Area. For more info, see iceagetrail.org/coldcaching. Devil’s Lake State Park: dnr.wi.gov/topic/parks/name/devilslake. Before our adventure, we stayed at the Best Western ($72/night) in Baraboo, a town just south of Wisconsin Dells with a population of 12,000. The hotel tries hard, in decor and staff. Nearly 150 years ago, the now closing Ringling Bros. and Barnum & Bailey Circus was founded in Baraboo. Sadly, the Circus World Museum was closed until spring. The sight of the train cars on the empty grounds brought on a nostalgia for daredevil motorists, flying trapeze artists and dancing elephants, along with guilt over animals held in captivity. Food in Baraboo was surprisingly good. For dinner, we ate at the Little Village Cafe (1-609-356-2800; ­littlevillagecafe.com), a restored 1940s diner anchoring the town square. Ringling Bros. posters hang on the wall. My son randomly ordered goat cheese, and was delighted by its rich taste. He gobbled it down while I enjoyed a roasted zucchini asiago soup. My daughter stuck with pasta.